Berlin, May 21 2017. 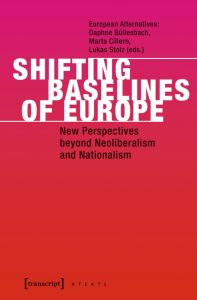 European Alternatives, the civil society network that works tirelessly to build new narratives for the Europe of the future, just released its new book: Shifting Baselines of Europe, New Perspectives beyond Neoliberalism and Nationalism. Commons Network co-director Sophie Bloemen contributed to this release with an essay on the commons as a new paradigm for a different, better Europe. Read the whole essay in Shifting Baselines, through this link. European Alternatives has offices in Berlin, Rome and Paris and is a partner-organisation of the Commons Network.